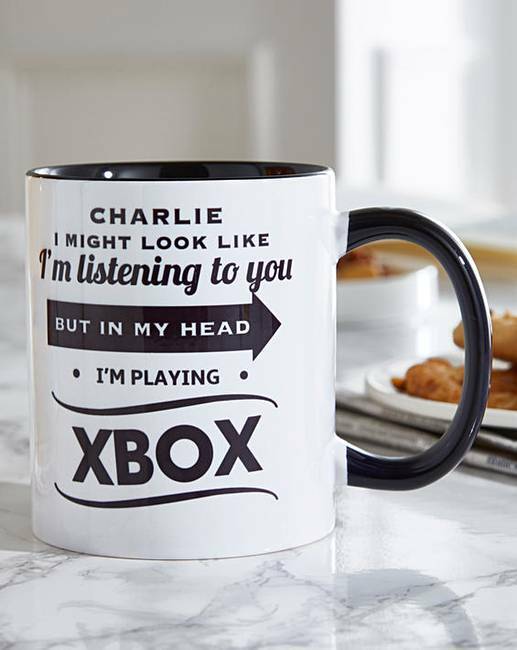 Personalised Look Like I'm Listening Mug is rated 4.7 out of 5 by 16. Personalise with name and what the person is 'doing in their head' up to 40 characters altogether. 'I might look like I’m listening to you but in my head' is standard on all. Rated 5 out of 5 by Fi fi from Great wording I brought this for my nephew for Xmas he's gonna love it. Rated 4 out of 5 by Jans jewels from Great mug I bought this for my husband for Christmas and he really likes it as he is always on his x box. The personalisation is good and makes it a bit more special. Rated 5 out of 5 by Jojo from Perfect for my husband I brought this for my husband as a joke Christmas present and he loved it. It’s well worth the money I paid for it. Rated 5 out of 5 by Gaza from Its a cup! Its only a cup you xant go wrong with it. But do like the xbox theme lol. Rated 5 out of 5 by vanessa from Great quality Bought for my grandsons for christmas. They will love them.